New shipment of Tennessee Crab Orchard (TCO) Irregular is in. The color of TCO is unique. It is not for everyone or any application but when it is the right stone for the right project – the colors and textures are exceptional. 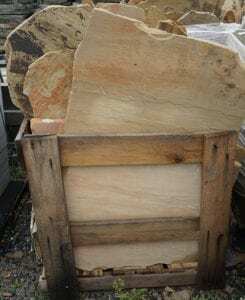 We’ve seen applications where the stone’s character really comes through, and the stone works well near water (hot tubs, outdoor showers, pool decks, water gardens). Each pallet weighs 3,000 pounds and covers 110 to 120 square feet. Delivery is available virtually anywhere.